An RCE is a network of existing formal, non-formal and informal education organisations, mobilised to deliver education for sustainable development (ESD) to local and regional communities. It builds an innovative platform for multi-sectoral and interdisciplinary information-sharing, dialogue and collaboration for promoting ESD among regional/local stakeholders. Additionally it also creates a regional/local knowledge base to support ESD activities. 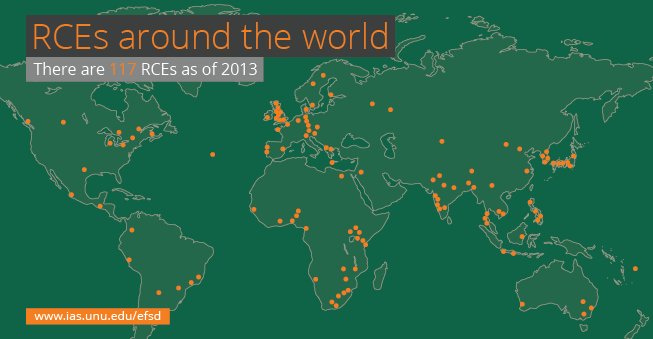 A network of currently 117 RCEs worldwide constitute the Global Learning Space for Sustainable Development. Together, these individual RCEs aspire to achieve the goals of the UN Decade of Education for Sustainable Development by translating its global objectives into the context of the local communities in which they operate.